SAMARITAN’S PURSE IS HELPING MEET THE ENORMOUS PHYSICAL AND SPIRITUAL NEEDS OF VENEZUELANS WHO HAVE COME TO COLOMBIA SEEKING A BETTER LIFE. 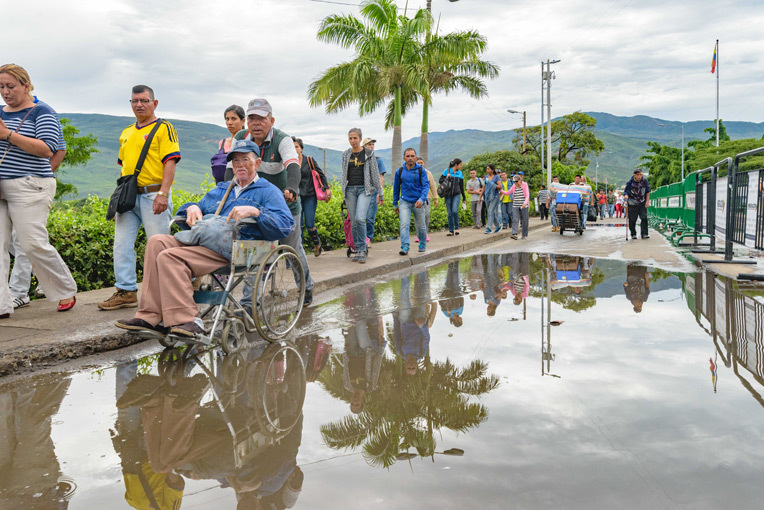 As Samaritan’s Purse President Franklin Graham walked the Simón Bolívar International Bridge in Cúcuta, Colombia on Monday, he was moved by the plight of the many men, women and children who flowed past him in a hurried stream. 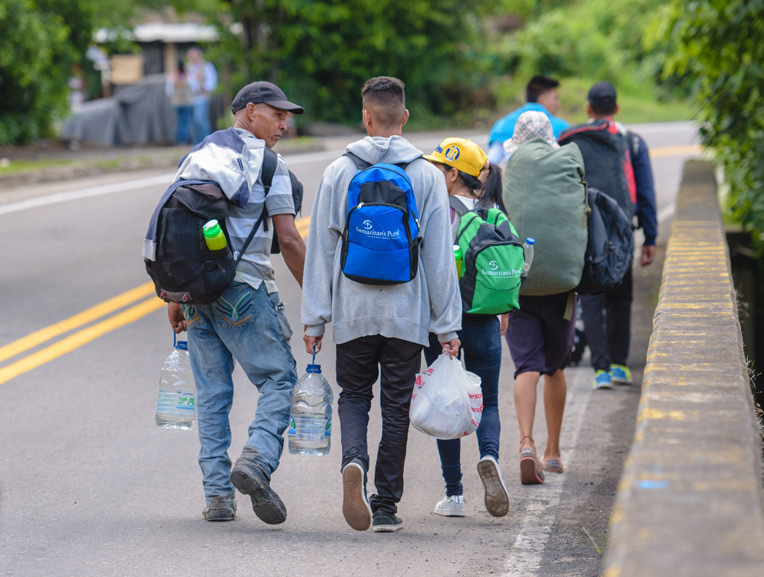 Every day tens of thousands of migrants travel from Venezuela to Colombia where they hope to help meet their families’ basic needs. There are young men, pregnant teenage girls, people in wheelchairs and families with young children in strollers. Some come carrying only a backpack; others push carts stacked with large suitcases. Thirty to fifty thousand cross the bridge every day. Many of the bridge-crossers are only coming to Colombia for a few hours to buy urgently needed food and medicine, or maybe to sell candy on the street. Others, desperate for money, sell their hair, a wedding ring or some other precious thing. They stay for the day in Cucuta, buy what they need or earn what they can, then return to the border town of Ureña, Venezuela at night. Many Venezuelans enter Colombia for good, hoping to start a new life for themselves and their children. However, a majority of these people will not be returning any time soon to their homeland. They’re done with Venezuela—its economic crisis, collapsing healthcare system and lack of jobs. Hyperinflation means that basic staples—like a bag of rice or a bottle of pain reliever—may cost as much as a month’s salary. Families are hungry, surviving on things like corn cakes, yucca, and sardines, and the hunger drives them to leave. The journey to Colombia can be difficult and dangerous, so some parents leave their children with family members, hoping to support them from afar. Others take their chances, bringing the little ones along. “The saddest thing is to hear from your kids, ‘Papa I’m hungry,’ and you have nothing to give them,” said 27-year-old Jorge. He left his wife and two kids behind in Venezuela, hoping to find work and send back money for his family. As migrants cross the bridge, there is desperation and anger. But, there is also a sense of hope on many faces. They’ve finally escaped the collapse of a nation and what lies ahead cannot be any worse. 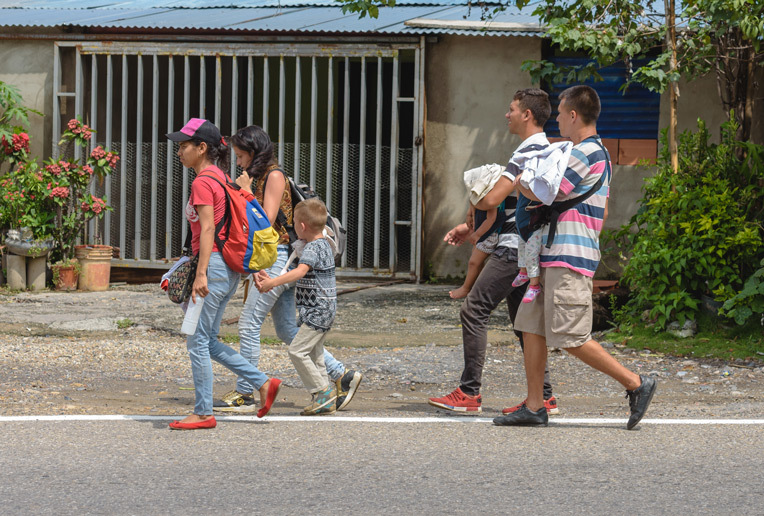 More than 2.3 million Venezuelans have left their country since 2014, making this the largest migration crisis in recent Latin American history. As migrants cross into Colombia’s Santander region, many of them will pass one of the three Samaritan’s Purse relief stations. 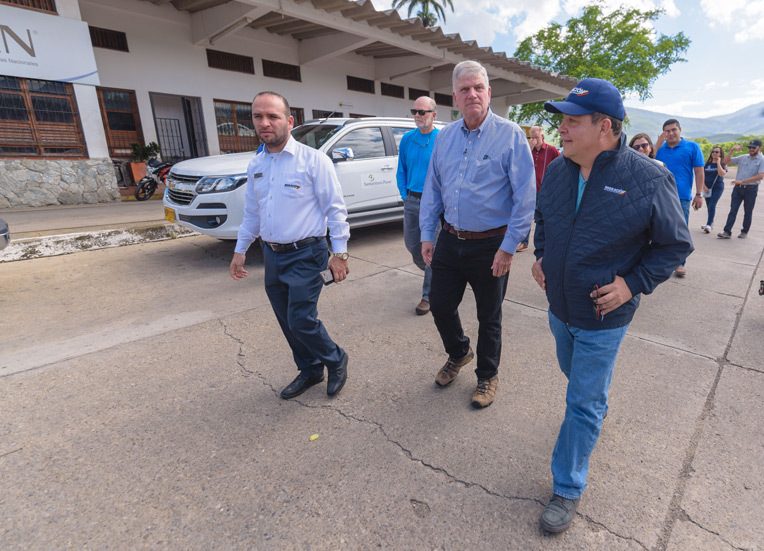 Franklin Graham and Samaritan’s Purse Vice President Ken Isaacs met with immigration officials and visited the area where our projects are underway. In the border town of Cúcuta, there is the Centre of Hope—a partnership between Samaritan’s Purse and a local evangelical church. At this relief station, men, women and children find medical care, legal advice, spiritual encouragement and a safe place to rest. University students volunteer to serve the children, giving them a fun place to colour and learn. More than 2,000 people visited the centre in September alone, and several hundred made decisions for Christ. The staff and chaplains at Centre of Hope are eager to share the Gospel and provide a loving place for people to find relief.  “I’m very impressed by what the church is doing for those who have so little,” Graham said. He toured Centre of Hope on Monday, meeting the coordinator, Jairo Antonio Garzón López, and staff physician Maria De Los Angeles Sarmiento. 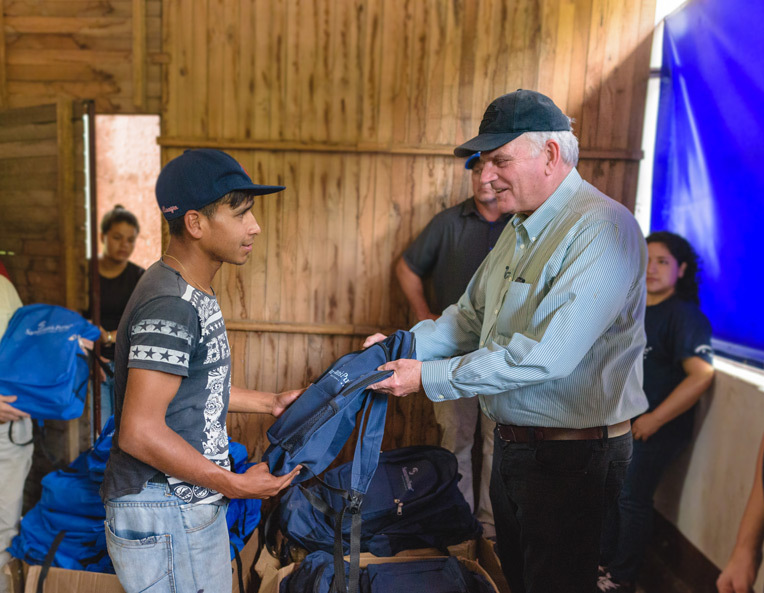 Franklin Graham helps distribute Samaritan’s Purse backpacks filled with daily essentials. Dr. Sarmiento was caring for a family of four at the time—Daniel, 24, and Michelle, 18, and their two children. The young family lives just over the border in Venezuela, and Daniel works in Cúcuta. Both Michelle and her 11-month-old daughter were struggling with chest congestion, and their two-year-old son has had sporadic convulsions since he was an infant. They came to see the doctor because they have so little money and so few medical options available to them. Dr. Sarmiento provided medicines for them, and took the time to pray with the family. Being able to provide physical and spiritual care is exactly why Dr. Sarmiento works at the centre. “I can put together helping people and bringing the Word to them,” she said. Graham also visited our second relief station—a migrant shelter in La Don Juana, which is about 18 miles from Cúcuta. Here, Samaritan’s Purse is meeting the needs of the weary walkers, known as “caminantes,” who climb hours each day toward a high-altitude pass on their way to Bogotá, or perhaps as far as Ecuador or Peru. They are often trying to reunite with relatives—husbands, wives, parents, siblings—who left Venezuela earlier. Franklin Graham meets with Jose Luis Ochoa. He was brought to Christ at the shelter and was baptised in the nearby river. All day long, caminantes come through the shelter, where they enjoy a hot meal thanks to the shelter coordinator, Viviana Paez. As many as 400 meals are served daily, and around 150 people sleep at the shelter each night. The migrants also receive backpacks filled with hygiene items, gloves, a hat, a poncho and a water bottle. More than 700 backpacks were given out in the first three days of distributions last week. They started serving food at a restaurant and set up a tarp for to provide shelter. Later, they moved the aid station to an old train building, and Samaritan’s Purse began supporting the work in September. “We are being Good Samaritans to help people along the road,” Pastor Jesus said. Doctor Maria De Los Angeles Sarmiento (right) and two nurses assess a woman’s wounded head. The third Samaritan’s Purse relief station is located about 40 miles from Cúcuta in Puerto Santander. There, Venezuelans go back and forth freely along the small Union Bridge. 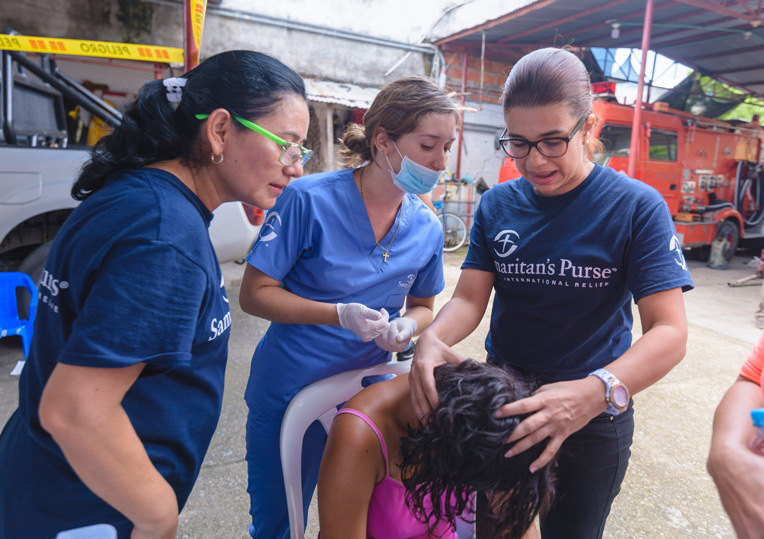 Samaritan’s Purse recently set up a mobile medical clinic in Puerto Santader, serving nearly 300 patients in the first 4 days. We provide patients with medications like antibiotics, pain relievers, anti-parasitics, skin creams, inhalers, vitamins and folic acid for pregnant women. 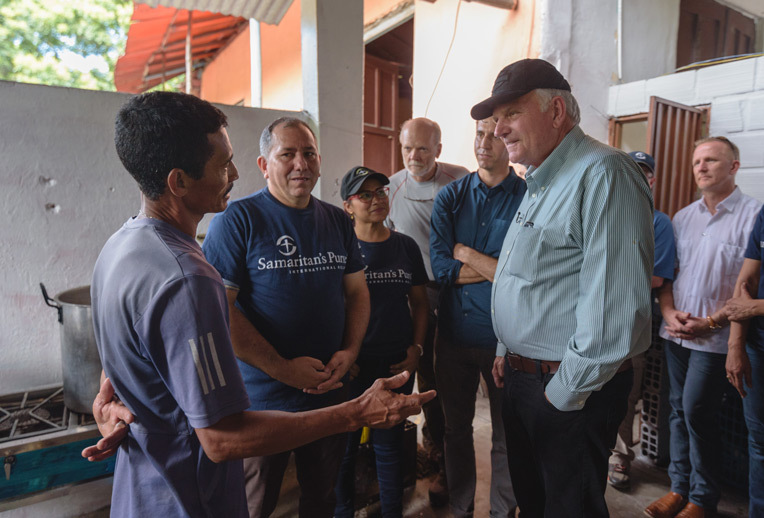 Graham assured both our local partners and the migrant families we’re helping that Samaritan’s Purse will continue our work in Colombia and build upon these initial projects. Please pray for Venezuela, for the thousands leaving and our church partners and staff ministering to them in Colombia. Families received backpacks from Samaritan’s Purse filled with warm-weather gear and other supplies.